Time once again for the Governor’s Cup. It starts at the Statehouse and winds through Columbia. Cara and I have been really busy with the move up north coming up, so we didn’t get a chance to train properly. Still, we had signed up for the half and we were determined to make a good day of it. Cara is going up there ahead of me, (she’s leaving Monday) so this is our last weekend together for a while. Thankfully, her friend John offered to fly down and help her with the drive. He arrived yesterday and Cara showed him around Columbia. While they were picking up our race packets, John decided to sign up for the 4-mile walk. It’s been a crazy month. I’ve been trying to get my online stuff in order so prospective employers are properly impressed, so I haven’t had time to run the way I wanted to. Plus, we moved in with my sister for the last couple of months on my contract. Her place isn’t runner-friendly, so I have to drive somewhere in order to get my miles in. The only other option is to use the treadmill at the gym. It’s been tough to schedule. Still, I was strong enough for this race as long as I didn’t get stupid and go for a PR. I expected the day to warm up quickly, so I wore my new Old Navy windbreaker. The idea was to wear it for a while and then tie it around my waist. Although it did get warm at a few points, the wind kept picking up before I decided to remove it. Over all, it was really handy to have the thing. Plus, I could run with it open at the warmer points without it sliding off. Good stuff. I stayed with Cara for the first two miles. She was cold and uncomfortable, but she started to warm up a bit and found her pace. After I went ahead, I noticed something interesting. Since I had gone at Cara’s slower pace for so long, I was slightly faster than everybody around me. I spent a good while gradually passing everybody. Even though I know it’s just an illusion, it was great for my morale. I felt like a super-athelete! Andy didn’t secure his number very well, so it was flipped up for most of the race. 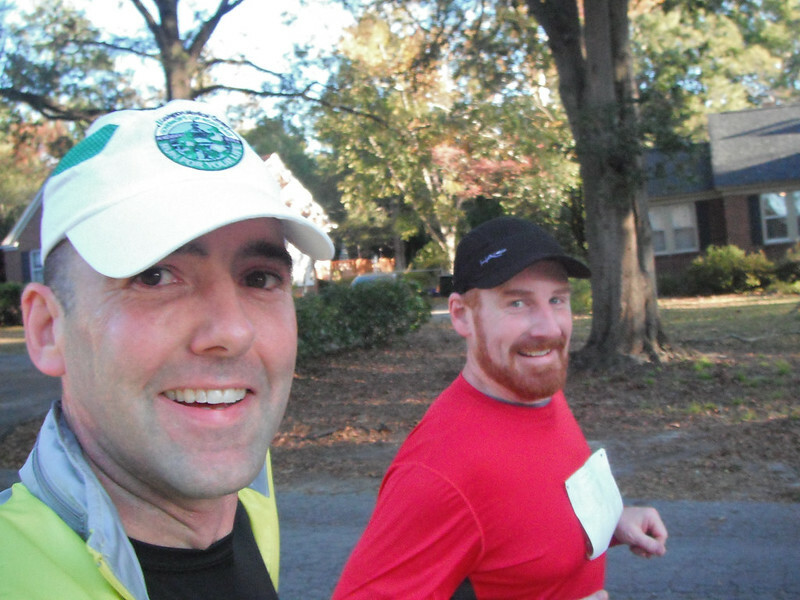 Eventually I wound up around folks my own speed, so I fell into my usual routine of finding the other talkative runners and chatting. 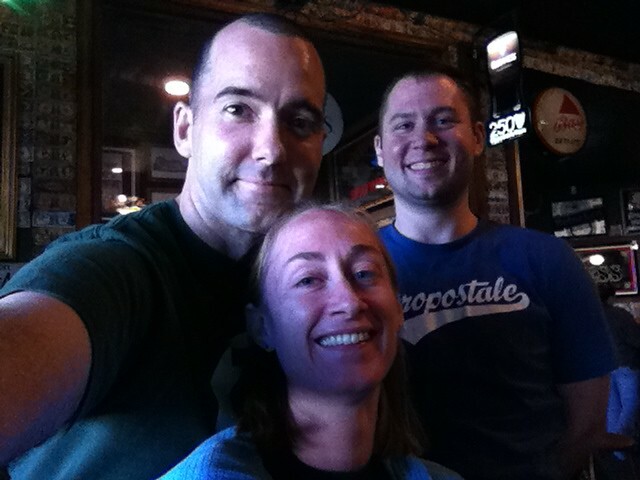 I was pleasantly surprised to meet up with Andy, one of the bartenders at Delaney’s, our favorite pub! He was planning to go a little easier than I wanted to, but he was going about the right speed. I stuck with him for a while, including a walking break, but he sent me ahead when his calves started giving him trouble. Once again, I surged forward and chatted up the other chatty runners. I was careful not to push too hard, though. I wasn’t trained for fast miles, and we have plans for the weekend. I just cruised on steadily until I reached the end. Just like last year, the last mile seemed like some kind of sadistic joke. There was a sizable hill on Blossom Street, followed by a right turn onto a steeper hill. It kind of reminds me of Vermont. One thing I didn’t like is how short the final stretch is. I like to have a visual on the Finish Line from a good distance so I can finish at at a strong pace, but here you just turn a corner and there it is. Still, the Finish Line was well organized and there was plenty of water and food available. John found me pretty quickly, and so did Keith. (He’s another one of our Delaney’s peeps.) Keith was waiting for Andy to finish, so I told him there wasn’t long to wait. Sure enough, a few minutes later I was able to get photos of Andy coming in. Then we just had to wait for Cara. John had remembered his wallet, and (because the man is a Saint) offered to grab some coffee from Cool Beans. It was insanely close, so he returned in just a few minutes… just after Cara came in for the finish! It was awesome. I didn’t expect her for another 30 minutes. I was going to drink coffee with John and then take her for one when she got in. This was very impressive for her. It turns out that she was afraid of stopping entirely, so she ran almost the whole event! She was only a few minutes behind me! Cara had some water, a piece of banana and a little more water before John returned and gave us both a coffee. Cara was shivering pitifully, so the hot drink was a welcome blessing. She was having a hard time, but we managed to get her home alive. It was a pretty good day, all things considered. 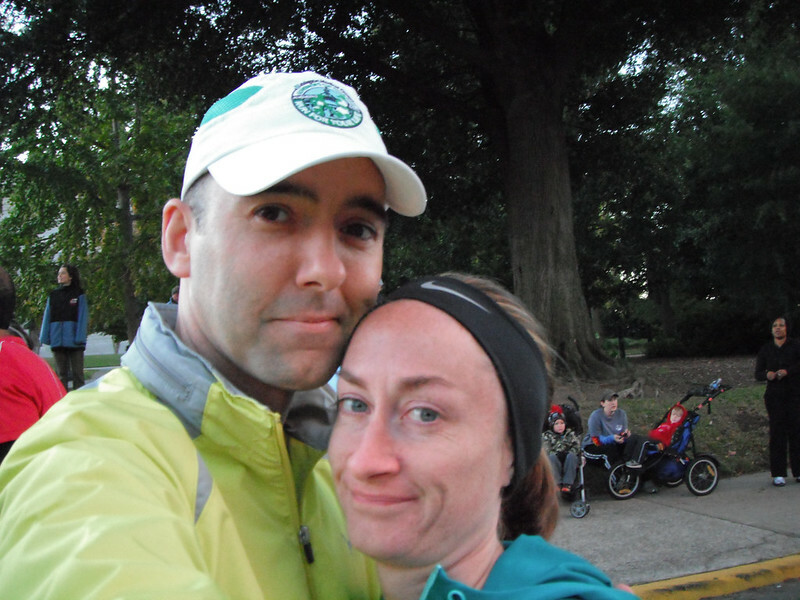 We had a good time, John got to see a good bit of downtown Columbia, and Cara scored a new Personal Record for the half marathon. Andy and Keith both finished with respectable times and made it to work alive, and those of us who weren’t working had a few pints to celebrate. In the end, everybody won.